Have the legal eligibility to work in the EU. Please note that there is no financial compensation, trainees must have an agreement with a University. 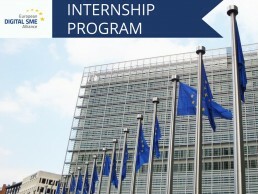 European DIGITAL SME Alliance accepts internship applications on a rolling basis. Please note that all the candidates must be students (preferably working towards achieving Master’s degree). The candidate must be enrolled at a university for the entire duration of the traineeship, and the traineeship must be part of the candidate’s study programme. team player, reliable, highly motivated. In the e-mail subject, please indicate ‘Internship’.